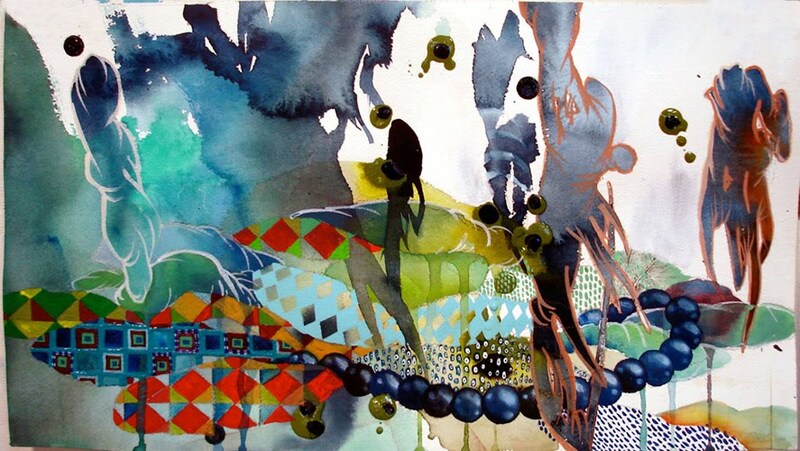 2007, Watercolor and Sumi Ink on paper, 76"x42"
Romance 2008, Watercolor and Sumi Ink on paper, 72"x53"
Candyland10 2008, Watercolor and Acrylic on Paper, 8.5 x 15"
My paintings depict ever-changing fantasy worlds where blood cells, rainforests and coral reefs collide and intertwine. Each piece functions as a man-sized porthole into a landscape alive with minute details, patterns and interlocking systems. 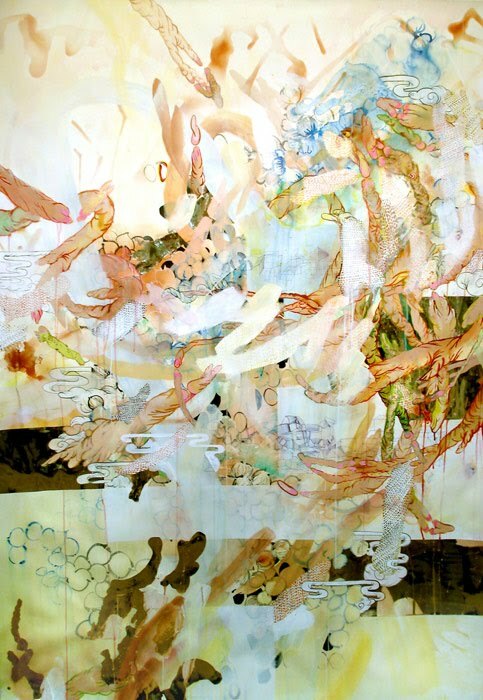 This is achieved through the conglomeration of minutia piled and cobbled together to create larger, overarching systems that define the whole painting. I work with ambiguous shapes that could function as elements in radically different environments in the real world—a scabby circular shape could be a marsh object covered with barnacles, a white blood cell, or a cratered moon. 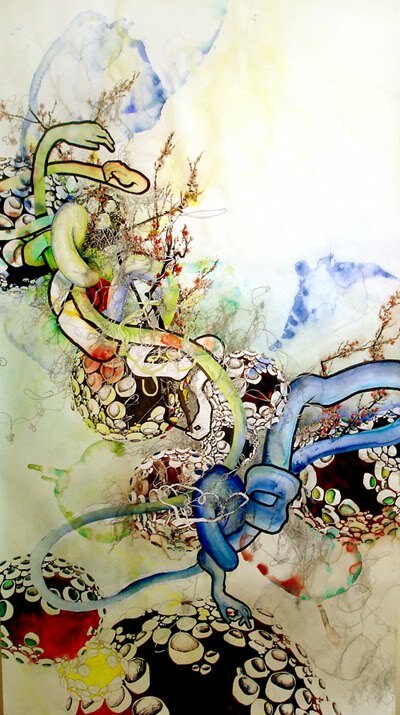 The real environments of reefs, outer space and microbiology are smashed, in each painting, into one incongruous whole. The desire to create epic realms begins in childhood, and I explore those early desires and anxieties by creating intricate fields that I find at once suffocating and fabulous. Racially and geographically incongruous myself, I consider the paintings to be hybrids, speaking a language of dualisms and abstraction to create fields punctuated by moments of absurdity, poetry, mutation, growth and decay. I glory in the sensuous and the rambling, but intersperse any chaos with moments of neurotic control. Like the fantasies and fears of childhood play, my paintings are epic narratives, entire societies of fleshy worms, ink noodles or patterned blobs. But they are also clotted, epileptic.